The jeep swerved over to the left and the driver leaned on the steering wheel to keep us straight. He turned too sharply and we cut back to the right, veered to the middle of the road and then flipped right over. The sound of metal grating along the ground and glass shattering did not bode well for the rest of the trip! It was way before dawn on Christmas Day when they came for me. I had expected them to be late or not to turn up at all but they were right on time. The bigger guy met me as I was coming down the stairs and, without a word, he took the rucksack out of my hands. It was silent and dark in the hostel reception and a figure lay asleep on a bare mattress in the room behind. I left some money on the counter and we walked out onto the street. The jeep was parked in front with its engine running. The man bundled my luggage into the boot and I got in. His partner sat in the passenger seat and we exchanged a bonjour as I scrambled into the back. There wasn’t nearly enough room such was the mass of cardboard boxes, gas bottles and tins of sardines. Again it was the big guy who pushed things aside and made more space for me. Several metal bars jutting out over my head forced me to lean forward and look unnaturally eager to make conversation with the two in front. My companions were traders making the trip over the border to sell goods. We had met briefly the day before and I had been told they were reliable. Their jeep was certainly packed with goods to be sold. We started out through the empty streets, making our way to the edge of town, past the police check-point and into the hammada. We headed north for about an hour, following the eastern coast of a peninsular until it met the mainland. Then we turned almost full circle and headed south, leaving the peninsular and following the coastline that would eventually lead to the border. The two traders, whose names I had forgotten from the day before, were friendly without saying too much. I tried to remember what French I could and the bigger one told me he had lived in Italy. The other added a word or comment every now and then but after a while we gave up the politeness and settled for a more relaxed silence. The road was dead straight and cut through the flat landscape with the ocean on one side and empty desert on the other. The tarmac was good and we cruised along peacefully until suddenly at daybreak there was a popping noise at the rear right-hand side of the vehicle. It was a distinct sound without being particularly loud. All three of us turned our heads automatically towards where it had come from. After a second or two the jeep swerved over to the left and the driver leaned on the steering wheel to keep us straight. He turned too sharply and we cut back to the right, veered to the middle of the road and then flipped right over. The sound of metal grating along the ground and glass shattering did not bode well for the rest of the trip! I saw the two men’s heads and shoulders thrown left as the side of the jeep slammed into the ground. We turned over and over, our bodies flung one way and then another. Finally the vehicle righted itself, stopping horizontal in the road with the front facing west, out towards the Atlantic. Before I knew it all three of us were standing in the road, checking ourselves for injuries but finding none. "Ca va, ca va?" we asked each other. "Oui, oui, ca va."
We stood in the grey dawn and the wind from the desert blew hard, scattering a few rags and pieces of cardboard across the sand. Nobody said anything more; the only thing to do was start gathering the damaged goods together. None of us touched the jeep and the punctured tyre hung there a few inches off the ground, the rubber torn apart. It took a good while to clear the road of split sardine cans, dented gas bottles and assorted items that were difficult to identify. Every now and then a loaded vehicle passed by, squeezing through the gap between our jeep and the edge of the road. An hour or so later a dark-coloured Mercedes drove up and stopped by the side of the road. Its two occupants got out and came over. The driver was middle-aged, thin and wiry, dressed in a dark suit and sun-glasses. He looked like a middle-eastern gangster. His sidekick was smaller, plumper and shabbier. They spoke in Arabic to the two traders and after a while glanced over towards me. All at once they focused on my backpack lying on the ground and their voices rose. Between them there was a whole lot of pointing, gesticulating and frowning. The man in the suit spoke French and asked me what luggage I had. "C`est tout!" I said, pointing to my backpack. He shrugged and turned back towards his car. Then, as he was opening the driver’s door, he raised one of his arms slowly into the air and called out, "Allez, allez!" The guilt I felt about abandoning my companions was overshadowed by the relief of still being alive and back on my journey. The road carried more curves now and every so often a jeep would flash past in the other direction, packed with men wearing blue and white robes. The sun had risen and suddenly the desert looked more like it does in the movies. The wind hadn’t let up but the landscape looked sharper and cleaner, there was a clear definition between the blue of the sky and the yellow of the desert sand. My new companions were silent at first, but gradually the driver started to question me about the accident. He became quite cheerful all at once and had a charm and confidence that I guess came from being a state official of some sort. He told me he worked for a government office and showed me his card to prove it. I asked him why he was heading for the border but he pretended not to hear. The other said nothing, his eyes fixed straight ahead on the open road. Along the way we stopped suddenly to pick up a perfectly preserved dead owl from the middle of the road, and later we stopped for breakfast at an impossibly remote roadside service station. Then, at around 1 pm. we arrived at the Mauritania border. It was a mixture of grey concrete huts, tracks in the sand, shabby flags on rusty poles, rubbish and assorted vehicles parked this way and that. Abruptly the man signalled for me to get out, pointed to the customs buildings and told me to head for there: he wanted to be rid of me as soon as possible. We said a brief goodbye and I left them. There were a few people milling about outside the low buildings, looking as if they were waiting for something to happen. I entered the first hut, filled in a form and moved on to the next. Inside this one it was darker, grimier and even barer than the first. On a trellis table there were crumpled sheets of paper, cigarette packets, ashtrays and fag-ends. It was cool but dank and airless. The officials eyed me with bored indifference and wanted to get back to their tea and chatter. Over to the right of the table a group of men sat on cushions, backs against the wall, talking to some of the other border guards. I showed my passport, signed something else and then a serious young official asked me if I was going to Nouadhibou. I told him I was. "Do you need transport?" he enquired. "Then speak to that man over there." He nodded towards the leader of the group, a small Tuareg dressed in black. He looked even sterner than the border guard. "Vous allez a Noudhibou?" I enquired. "Yes." He answered in English. I was impatient to get going. "When are you leaving?" The man looked over at his group and the glasses of tea. "Soon," he replied. I walked out of the hut and sat down on my backpack in a bit of shade. From where I sat I could hear the voices of the men and the sipping of mint tea and their laughter. I opened my book and was happy enough to be half way to my destination. After an hour I went back in and addressed the man in black. "Do you know when you’re leaving?" ´Yes, yes... very soon." I went back outside, trying to look patient. Just when I had decided to look for another ride voices were raised and suddenly a whole assortment of robed men poured out of the hut. I searched out the leader again who sighed when he saw me. "You with them," he said, pointing at two men getting into a battered white van. "Who do I pay?" I asked. "Pay the driver," he told me and then hurried away. I got in the front and sat between the driver and another man. They were Saharawis and spoke some Spanish, telling me they were traders carrying food to sell in Mauritania. This pair certainly looked like they had made the trip many times before. The driver’s name was Mohamed; he was middle-aged, heavily-built and prone to bursts of laughter for no apparent reason. The other remained nameless and was older, sharp-faced and grumpy; he sat the whole time hunched over, trying to light his Marlboroughs without falling out of the broken door of the moving van. Mohamed told me he had lived in Cuba and I tried to imagine him in his blue robes walking through Havana. We headed off in convoy with several other vans, bumping up and down the ditches and low dusty hills of no-man’s land. There wasn’t just one track to follow but several that joined and separated at frequent intervals. None seemed more definite than the rest. I secretly worried we might stray off the main route and into the mine-filled sand. Progress was slow and intermittent. Over the next hour or two we must have stopped, got out and drunk tea three or four times. My two companions showed no signs of urgency or desire to arrive — getting to Nouadhibou seemed some dim and distant objective. Priority was given to socialising along the way, handshaking, greetings, catching up and back slapping; every now and then an official was discreetly slipped a note or two to ease us through yet another checkpoint. 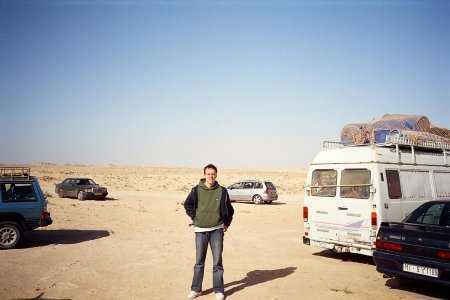 Before the Mauritanian border we stopped at an improvised car-park in the middle of the desert. Everyone piled out of their vehicles and went for another brew with a man bent over the bonnet of a range rover. I later found out this was a place to sell and dismantle stolen cars from Europe and it looked like a junkyard at the end of the world. Suddenly, while I was waiting in the sand for the others to finish their tea, the little government official who had given me a lift appeared from over a sand dune and hurried towards me, sweating in his thick grey suit. He passed me, murmured a greeting as if he had never seen me before, and disappeared behind a mass of stripped cars. That was the last I saw of him. A little further on we came across a small settlement away to our right. It was nothing more than a few rags and plastic sheets pinned to sticks and stretched out to form a shelter. As we approached, figures rose from underneath and ran towards us, awkwardly racing each other through the sand. We slowed and pulled up at the side of the track. The figures gathered around the van and their dark features were rounder and blunter than those of the other people I had seen on my journey. All were young men wearing T-shirts and scarves around their necks. I turned enquiringly to the old man next to me. Mohamed got out and went to the boot. They saw my face through the open door and gathered closer. "Water. Do you have water?" one asked. They looked at me expectantly. "Are you from Bangladesh?" I asked. "Yes, yes," one answered, "We want arrive to Europe." "The police in Morocco left us here, we are here now three weeks." "How do you get food?" "People stop and give us. 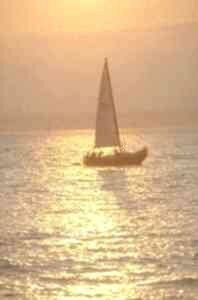 And water too, but we always need water." The old man and I got out and scraped together some water and food. From the boot Mohamed was filling a plastic bag with fruit and vegetables. One of the Bangladeshis was more anxious than the rest. "Medicine also, do you have any medicine?" he asked. I gave him my emergency travel kit and a compass. It was all I had, but it didn’t seem very much. It was difficult to know what to say to them even though most of the group were much more cheerful than they should have been. We talked for a few minutes as if we were somewhere altogether entirely civilised. Before leaving I took a photo of four of them, standing there under the cloudless sky, their arms around each other’s shoulders. As we were getting back into the van two of them handed me a scrap of paper with a couple of email addresses scribbled on. "Write when you get home please," they said as they gave it to me. As we headed off, one of the quieter Bangladeshis ran after us, following the van up and down the sand dunes, hoping we could still somehow save him. As we came to flatter ground and picked up speed he gave up and stopped still in the middle of the track, forlornly watching us move away. After a while we reached the breast of a hill and in the distance appeared another set of huts and beyond that a broad, green Mauritanian flag flapping in the wind. Here we had to stop and repeat the form filling and passport checks. Then, far quicker than I had anticipated, the border guard stamped my passport and I was free to pass. Outside my grumpy companion from the van suddenly appeared at my side and steered me towards one of a group of men waiting at the border post. We crouched down at the side of the road out of the wind and the money-changer counted the ouguiya into my hand. Happy to have exchanged my dirham for the local currency I left them to huddle together. We headed off once again in convoy and it was strange, to say that at last, to have actually reached Mauritania. The sun was beginning to set and we celebrated our arrival with cigarettes, the three of us smoking silently in an end-of-the-road satisfaction. We made our way to Nouadhibou, not far from the border at the end of a peninsula. On its outskirts we stopped at a garage and in the last rays of daylight. Half-naked black kids gathered around the van, their blank faces peering in at us. Along the main road into town we left the rest of the convoy, turned off right down a sandy track and weaved along lanes between shacks and low, one-storey buildings. This was the shanty town I had read about. We came to a halt outside one of the buildings and the two traders disappeared without saying a word. I sat for ten minutes and tried not to lose my temper. After another five I contemplated getting my bags and walking into the centre. Instead, I followed the sound of voices which led me to a small house a few yards away. I saw a light through a crack in the door and pushed it open. Inside were the two traders, the serious Tuareg leader, about four or five women in colourful shawls and a number of small children. They looked up as I entered as if they had been expecting me all along. Everyone was sitting on cushions on the floor. "Ah, my friend, come in," the Tuareg leader said with a big smile. Here he was a changed man. I was ushered in and they made a space for me to sit down next to one of the women. "So, how are you?" the man asked in Spanish as if I was an old friend he hadn’t seen for ages. "Fine, fine thanks," I replied, and the others seemed pleased. Mohamed was smiling and explained I lived in Spain. "But are you Spanish or not?" he asked. "No, no, I'm English but I live in Spain," I explained, and they all nodded. "I’m an English teacher." They smiled and nodded again in approval. The young woman next to me was about my age and flashed her white teeth as she showed me the English books she was studying. She too spoke Spanish and told me about her studies. Someone started passing around a plastic bowl full of a murky-yellow coloured liquid, and as I observed its passage from one person to another, I hoped it wouldn’t make it all the way around to me. But, sure enough, eventually I was handed the bowl and the others watched as I took a sip. The mixture was cold, sweet and tasted of something between milk and corn; to my surprise it was a great deal nicer than it looked. The atmosphere was relaxed; people laughed and gossiped amongst themselves while the woman beside me smiled and fluttered her long eyelashes. Then all of a sudden the leader addressed me with a glint in his eye. "She asks if you want to stay here for the night," he said, indicating the woman at my side. This was met with laughter from the others. I wasn’t sure if it was for real or a joke. "You are very welcome," he added very seriously. For a few moments I couldn’t think of what to say but guessed the offer was genuine. I didn’t want to appear rude but I was desperate to lie down in an empty room, so I lied and told him I had to meet friends at a hostel in town. The man nodded gravely and a few minutes later Mohamed rose, nodded to me and I said my goodbyes to the rest of the group. The main street we drove along was mostly dark, every now and then a street light shone out weakly, illuminating shop fronts and bundled figures lounging by the side of the road. Battered old green taxis passed by, looking like they had been hammered together by their owners with sheets of metal. Among the people on the pavement were goats foraging in mounds of rubbish. We stopped in the centre just off the main road and the instant I got out of the van a young man approached me with his hand out and an introduction in English. "My name is Abdul. This way to the hostel." I looked to Mohamed for an explanation as to who this was but he was already pulling away. I followed Abdul as he headed towards a building in front of us and as we got nearer I saw the name of a hostel above the entrance. "This isn’t the place I’m going to," I told him. "It’s okay, this is a very good place." "But I have friends to meet at the other," I said, and told him the name. "But that one is far away, this is a good place," he insisted. "I’m sorry, but I really should go to the other." Abdul took my insistence well. "Okay, but you need a taxi." He stopped one instantly and waved me away when I asked if he was coming too. Ten minutes later I was dropped at the southern edge of town, on a corner outside an office building and a long high wall. I rooted around in the dark for a while examining my surroundings but I could see nothing which looked like a hostel. Eventually I found a metal gate fixed into the wall and pushed it open. Inside I made out a large courtyard, a number of chalets and over to the right a large, flat building. In a hut next to the entrance a group of Mauritanian men were sitting playing cards. They told me that this was indeed the hostel and a tall, thin, studious-looking man with glasses took me directly to one of the chalets. I was soon standing alone in a big, bare room with a choice of three beds to sleep in. Never was the sight of one more welcome, but there was still a little of Christmas Day to go. I ended it at a Chinese restaurant a little way up the road. It was a curious place that offered more than just food. Attached to it were a semi-clandestine bar and brothel. On entering I passed through the bar area where a number of African women sat around silently sipping cokes and waiting for customers who looked unlikely to arrive. The look of boredom and resignation on their faces made them one of the most spiritless groups of people I had ever seen. In one corner two drunk Russians tried to cheer up one of the girls by yelping and slamming their glasses down on the table top. 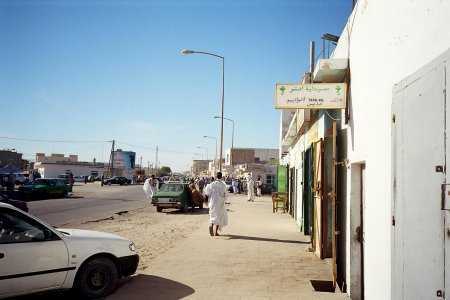 I wondered if it was just a quiet night and if there was much call for a place like this in Mauritania. In the dining room I sat alone at a table and drank expensive Dutch beer from long, slender cans while two Senegalese waiters watched the news on a huge ancient television at the far end of the room. I pondered the events of the day and how to explain them to people at home. Just then another waiter shouted through my order to the unseen chef in the kitchen behind. "One chicken in black bean sauce," he cried in English. For a moment it was like being back home. If you enjoyed reading the above article then you will probably also enjoy Venice, also in Europe, and our latest articles covering the Orinoco Delta, La Mata, Marbella and Beijing.